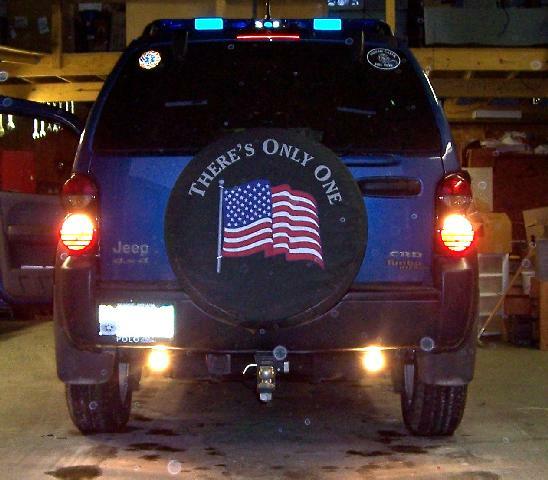 I recently installed a set of reverse lights on the Liberty. The factory reverse lights seemed dim and wimpy. I bought a cheap set of Pilot lights from Walmart. I've found these work as good as any for the money. I mounted them under the Reese hitch toward the ends. I connected the power to the trailer harness reverse light lead since it is powered through a relay. I got everything wired up, put the Jeep in reverse, and...Holy Crap, the lights are dimmer than before. Even the new lights were very dim! I pulled out my Jeep service manual and investigated. Hmmmmmmm. The trailer reverse wire is NOT powered via a relay. It's just spliced into the normal reverse light wire that comes from the transmission. That's kind of chincy. Now I'll have to open up the back of the Jeep and install a relay. All the connections I needed to make for the relay were available in the right rear quarter panel. The four ganged relays are the trailer tow relays. The box and cables inside the fenderwell are for my fire department strobe lights. The space inside the right rear fenderwell is cavernous. Not so much the left side due to the fuel filler. The frontmost relay supplies 12V to the trailer connector. This is where I'll get the power and ground for the reverse light relay. It is a 30 amp circuit and I don't forsee ever using it through the trailer connector. 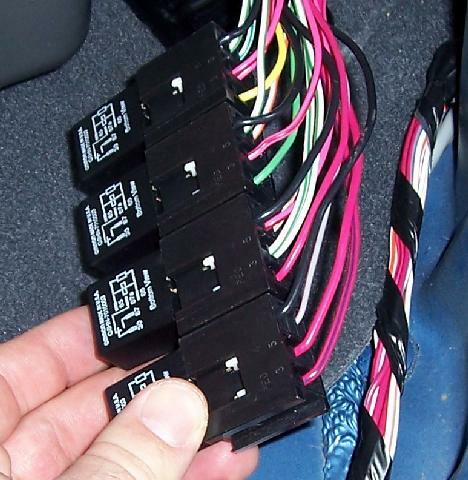 The other three relays convert the Liberty's separate brake and turn signals to combination brake/turn signals for the trailer. 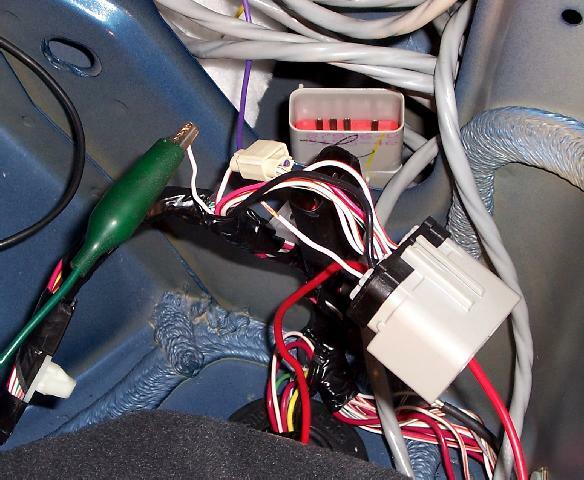 The white/gray wire connected to the green clip lead is the reverse light wire from the transmission. It will be used to trigger the reverse light relay I'm adding. The wires going through the round grommet at the bottom go to the trailer connector. 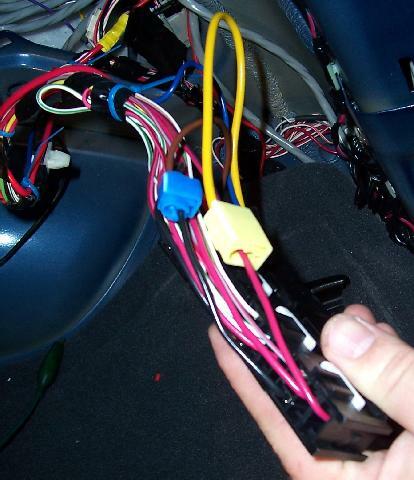 The larger red wire is one I've connected to the auxiliary reverse lights I added. I ran the wire through the rubber grommet. 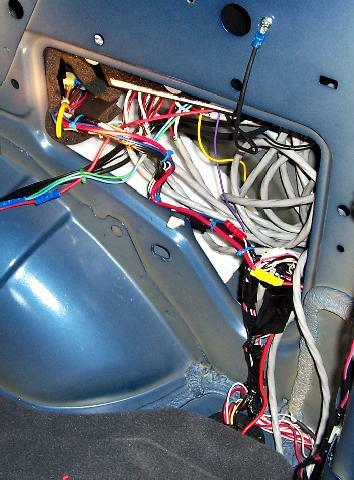 The trimmed white/gray wire goes to the factory reverse lights and trailer connector. I'll be powering this from the relay to give it a better source of power. This also decreases the electrical load on the wire from the transmission. 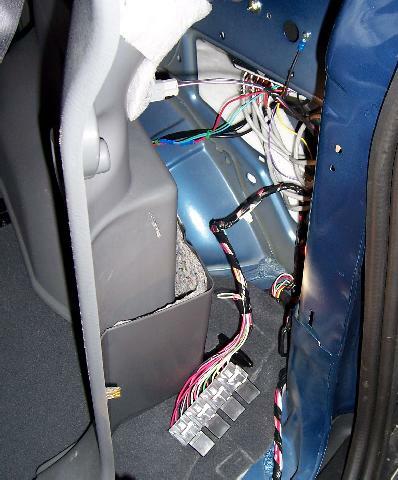 The purple wire is a dimmer for the strobe pack and connects to the parking lights. All the connections have been made and the wires zip-tied. The yellow wire is the power to the relay. 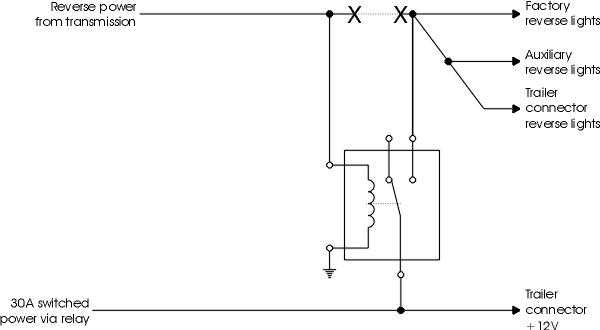 The brown wire is the ground for the relay. I usually solder my connections but I was feeling lazy today. The relay bundle is tucked back into the fenderwell and the trim is put back in place. Now all the reverse lights are nice and bright. Here is a schematic of my reverse light mod.